New Wave Domesticity: coconut lime cupcakes! yesterday was st. patrick's day. i guess don't feel any great attachment to the holiday because i feel no great attachment to its catholic roots or history and i'm not irish (as far as i know). but in case you are really into the whole green st patty's day thing, i have something green for you! these were actually something we made up this weekend completely unrelated to st patrick's day. my friend, heather, was feeling really down this weekend, so we decided there was no better solution for that than to bake up some yummy cupcakes! we actually made 2 types, but i will post the other in a bit. whisk together flour, baking powder, and salt and add to the mixture. add the milk and vanilla. mix to combine. add the zest and the lime juice. we wanted to get a really tart cupcake with a really distinct lime flavor, so we probably used about the juice of 2 limes, but one lime is good for a more mild flavor. at this point, heather threw in a handful of shredded coconut to add texture and flavor, but that is optional. i personally didn't like that texture, but a lot of people loved it. add coconut milk and extract and continue to mix. the coconut milk makes this really wonderfully light and fluffy if you allow it to beat for an addition few minutes. if you would prefer a more thick piping consistency, you only need to beat this up until fully combined. this is seriously the best coconut frosting i have ever made. it was light and fluffy and had really great taste to it and was not at all too sweet. i am kind of adverse to too much sweet in a cupcake frosting...which might explain why just about all the frostings i make are cream cheese based. i think cream cheese is a good balancer. i am considering adding the left over coconut frosting to some lemon crepes later this week even. stay tuned. 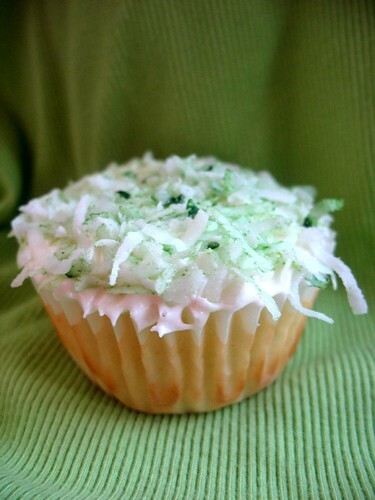 we topped the cupcakes with some shredded coconut that i died green to give it a spring-y look. how do you dye coconut? well you put regular shredded coconut in a jar or tupperware with a couple of drops of liquid food coloring and just shake the heck out of it until the color disperses through the coconut. easy peasy.